India - two thirds of the country is suffering from drought conditions. India has problems of its own. Two thirds of the sub-continent is hit by drought and in the State of Maharashtra, with 40 million people, the monsoon has failed for the third year running. No rain can be expected, or hoped for, until June and in some areas people are queuing for eight hours to draw water from a single pump. 25 million people are reported destitute in Maharashtra alone and the crisis is already more acute in certain areas than the Bilrar famine of 1966/67. Bombay and Poona, already surrounded by some of the worst slums and shanty towns in the world, are expecting an influx of between one and two million each, and all roads into the two cities are now lined with desperate people straggling in with the hope of finding food and water. that in the stricken state of Mahar ashtra, more money has been spent on emergency relief in the last two years than has been spent on irrigation in the last twenty years. UN Agencies, government bodies and charities are now involved in the agonising debate on whether to scale down relief programmes in favour of longer-term agricultural development projects. 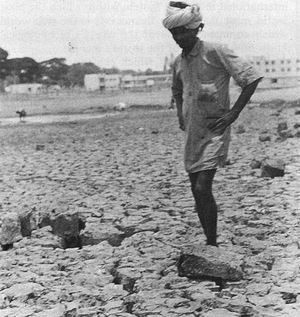 The only note of optimism is that the present crisis on the subcontinent will force governments and aid-giving countries to give more priority to irrigation schemes, land reform, rural credit systems, farming co-operatives, and agricultural training, without which the rural areas, where 80% of the people of the developing world still live, will always be vulnerable to the acute mass-misery of drought and famine.